Winter, for me, is a season of cleansing and stark beauty. The simplicity of the silhouettes of bare branches against a steely grey sky speaks softly to my heart, also in need of a restful moment or two. Snow is a constant wonder to me, though not in the same way it was when I was a kid barreling down the long steep hill behind our farmhouse on a wooden sled that surely was dangerous with its rusty metal rails. In fact, a new unblemished blanket of white has just fallen overnight and my current home’s window frames a comforting innocence, the usually busy city street out front muffled. Soon a gaggle of neighborhood kids will be sliding down the gentle slopes of the school yard next door. I suppose the wonderment I have for winter white is that it is a great equalizer. An eyesore and a masterpiece look nearly the same under a mantle of snowflakes. Neighbors who may do no more than nod hello in every other season gather together with shovels on shoulders to clear the alleyway connecting all their homes, shouting stories about their kids or the city’s sports teams over the scrape of shovels against asphalt. For at least a few hours, everyone in the world seems a little more considerate. A little more wholesome. 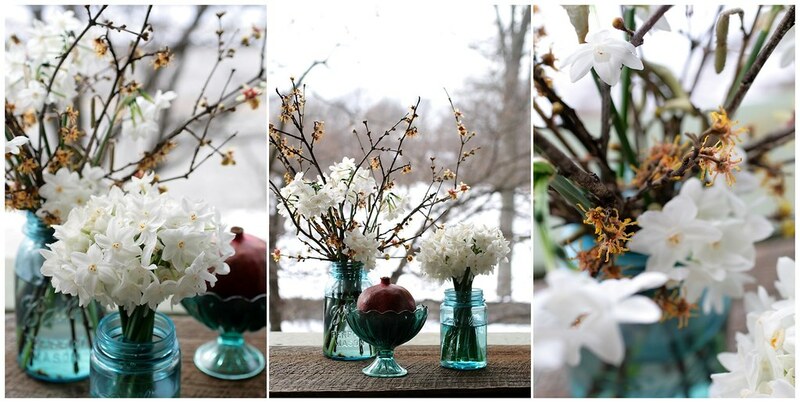 The food of winter is also wholesome, in a way delicate spring lettuces and indulgent summer fruits can’t be. Winter fare should fill you up and stay with you to warm your belly through that cold jaunt to the car or train. I’ve been rediscovering the joy of cooking this winter, after having burnt out my inner creative cook during the heat and hubbub of summer. I’ve been taking my time in the kitchen, no longer reaching in the freezer to pull out a pre-made this or that because it would be fast and easy. I’ve been cooking to make myself happy; to treat my tastebuds; to eat more winter vegetables. This Warm Winter Whole Grain Salad has become a staple in my diet the past month or two. And, while I can’t claim it to be a miracle cure, it certainly seems to have contributed to my happier and healthier state of being this winter. On Saturday night I soak the wheat berries and then spend a relaxed Sunday afternoon making the rest so I have a delicious dish for lunch every day that week. I have as yet to get bored with it, the wheat berries and barely so chewy and nutty. The butternut squash is sweet, especially with that hint of nutmeg, contrasting with the salty feta. The beans, rich in protein, add a creamy quality to each bite. This salad can be your main dish or an unexpected side to a winter feast. Don’t be put off by the length of the recipe or that it appears to take up a good deal of time. While this salad does require you to be a bit organized, it requires surprisingly little hands-on time once you have the butternut squash peeled and cubed. The first bite will make it all worthwhile and your winter a little more wholesome. * You may need more than 6 cups of liquid. I sometimes use a cup of vegetable stock to give it a bit more flavor. ** If you can’t find the orange muscat champagne vinegar, a high quality balsamic will work just fine on its own. 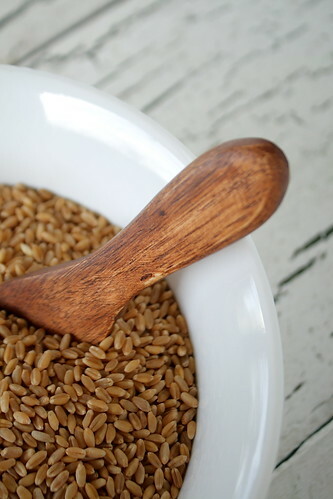 Place your wheat berries in a bowl and cover with cool water. Cover bowl and allow to sit for at least 4 hours; overnight usually works best. When you are ready to use the wheat berries, drain and rinse before proceeding with the recipe. Preheat the oven to 350 F. Peel and cut the butternut squash in half lengthwise (I usually also cut the “neck” from the “bulge” to make for more efficient chopping). Scoop out the seeds. Dice the orange flesh into rough half inch cubes and place on a foil lined baking sheet. Drizzle with a tablespoon of extra virgin olive oil and season with the nutmeg, salt and pepper. Toss to combine and place in the hot oven. Roast until cubes are tender but not mushy, about 20-30 minutes. Set cubes aside to cool. They can be stored overnight in the fridge. Bring water to a boil in a large pot. Add a little salt like you would to pasta water. Carefully slide the drained wheat berried into the water. Return water to a boil and then reduce heat to a high simmer, leaving the pot uncovered. Cook for about 35 minutes and begin testing by chewing a grain or two. When wheat berries are tender enough to chew but not soft yet (usually 35-45 minutes of cooking), add the pearl barley (you may wish to rinse the barley first to remove any dusty debris). Continue to simmer until both the pearl barley and wheat berries are tender but not mushy, about another 15-20 minutes. If liquid is getting low, add another half cup at a time of hot water. When done, drain off any remaining liquid and transfer to a large bowl. Peel and finely dice the red onion. Heat a tablespoon of oil in a large skillet. When hot, add the diced onion and cook over medium heat until tender, about 5 minutes. Meanwhile, rinse and drain the cannellini beans. Add to the onions and toss to heat through. Reduce heat to low and move all the beans and onion to one side of the skillet. On the empty side of the skillet, whisk together the remaining 4 tablespoons of oil and the vinegar(s). It helps to tilt the skillet a bit to collect the liquid so you can whisk it. Taste and add more vinegar if desired. Once you have the vinegar and oil to your liking, gently toss the beans and onion with it and remove from the heat. Season generously with salt and pepper and pour over the bowl of cooked wheat berries and barely. Toss gently to combine. Now add the roasted butternut squash and toss again. Allow salad to sit for at least 30 minutes to soak up the dressing. Salad can be stored, covered, in the fridge for up to a week. It can be served at room temperature or hot (a minute in the microwave does the trick). Top each serving with a crumble of feta cheese and some cooked chicken if desired. A handful of cranberries are also a nice addition. Entry filed under: Recipes, Salads. Tags: cooking, food, recipe, vegetarian. Thanks for posting this! I love wheat berry salads, and I’m always looking for a good recipe. 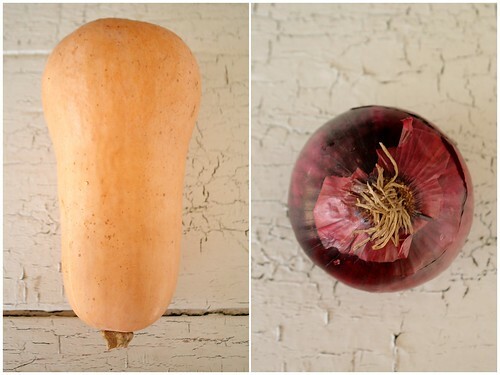 Will be a perfect way to use up another winter squash. I tried a wheat berry salad quite some time ago and was so disappointed. I have a feeling this recipe would be much more appealing to us. Looks wonderful. Beautiful recipe! Thanks for your thoughts on winter; I have to remind myself periodically about its beauty and all the adventure it offers. It’s all too easy to get sort of focused on the hardship. Two feet of brand new snow here today in New Hampshire! Just sent you an email — loved your article yesterday!!! now – this dish looks great and soooo healthy ! The snow just keeps coming! But my one solace is that the groundhog didn’t see it’s shadow…..actually that doesn’t help. This looks incredibly tasty and satisfying. I love the sweet way you wrote about neighbors and eyesores. I never really learned how to make simple, every day meals. This looks easy and great! I’ll have to try it out! Oh wow! What a delicious salad! Such beautiful fall colors in that salad. Looks absolutely delicious. Wow, this looks really delicious! 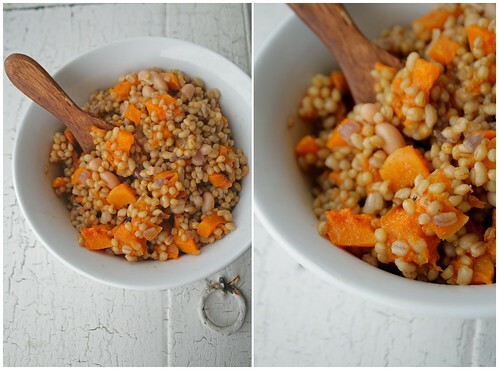 I’ve actually never used wheatberry, but I will definitely have to try this recipe. This looks absolutely delicious. Can’t wait to try it. Great post! This is a wonderful recipe! Hi! I am also a resident of Philadelphia and just read about your blog on Design Sponge. I am thrilled to read a blog that is aesthetically pleasing AND well-written. New to the blogging scene, I have had a hard time doing both well. Thanks for the inspiration and encouragement! I’ll be back. Wow, this was SO good and I don’t care for squash! Be sure to plan ahead, the grains take that long, our dinner was late, but it was worth it. I got the Orange Muscat Champagne Vinegar from TJ’s, you MUST not substitute, not expensive either! It makes the flavor what it is, I briefly marinated chicken breast in a little of that as well as olive oil and sesame seed oil then fried it in a little oil. I thin sliced it and added to salad served at room temp. Added craisins. Served it with fresh bean sprouts, cashews, and French’s crisp fried onlons on the side, amazingly tasty. Love your writing. Beautiful photos. Very clear and easy to follow cooking instructions. I think I have all the ingredients to make this salad. 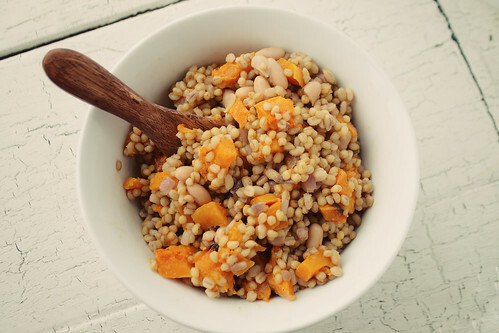 I love both squash and wheat berries. I am happy to have this on my list of lunches to make! the internet via a website. Thanks for finally talking about >Warm Winter Whole Grain Salad | Straight from the Farm <Liked it!